FL3301 digitally transmits high-resolution RGB (up to WXGA) and stereo audio over one fiber, single-mode, 1310nm wavelength. Point-to-point, point-to-multipoint and drop-and-repeat applications, it supports VGA, SVGA, XGA and WXGA (640 x 480, 1024*768, and 1280*1024) or RGBHV format. 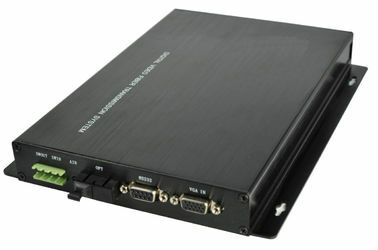 FL3301: 1-ch VGA,1-ch Audio,1-ch RS232, single fiber, single mode, up to 20KM, stand alone.